Topic: Hessian 1890's Brass EM For Sale SOLD !!! Re: Hessian 1890's Brass EM For Sale SOLD !!! This sold about 7 months ago. I would like a separate post with ersatz. Great info, thanks for posting. Is there an order form? Yes look at the bottom of the page , I think that there is a link to click on. Or maybe I need new glasses. Yes with no more pictures to look at , I would go out on a limb and say original hardware and repo leather . Cool cat! Did you make the mini-haube? No it is off of a 1/6 scale figure. 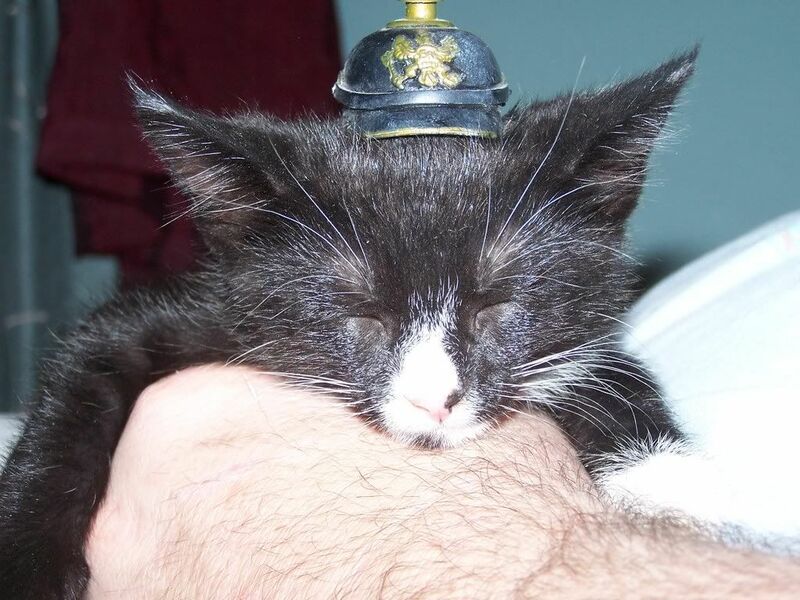 Here is my little girl in a pickelhaube . I saw this on ebay and a lot of people wanted it . 67 bids and the price went through the roof !!!! That ventless spine makes all of the difference in the world. You are lucky to have won it but you paid dearly. I see all the humor in that . My wife not so much. Looks like it did not transfer THE DAD TALKING TO SON ABOUT PLAY. Any way to see the camo helmet / weapon in question ? Topic: Should I try too restore? Re: Should I try too restore? Those oldies go for $3,000 to $5,000 . This one would bring more. It is a beauty !!! I as well would like to add this to my felt collection. Not holding it in my hands. It looks tight and right to me. But I am missing half of your pics. Got it worked out . Put me down for one ! But the click on does not seem to work. And here is one that was not random at all! The pics of the helmets makes me SMILE !!! No that front visor was never hammered flat . Looks to be a replacement visor. The small leather bucket was always cut off by post war collectors . They had a tendancy to get in the way and the quick fix was to cut them off. Not sure of any Elvis sightings down here but temps got to 45 F when the vortex hit. Yes it is a 1915 felt. If you ever are looking to sell it felts are my thing !!! Called the guy by name. Possibly a friend of the seller who up bidded and did not get over bid. They fit perfect in the brass grommets and the studs ( threaded studs ) have not been moved. I got a brass Wurt EM about 25 years ago . It has stampings that may be a Prussian helmet not Wurttemburg. It is in pristine condition and has original cocardes and c/s. I am not up on swords but that is an English coat of arms. Yes a great find indeed . At this time in my life I am moving in the opposite direction. Treat it with care Amy . I agree with all of the others. If you want to make your own, old soup cans work as well.